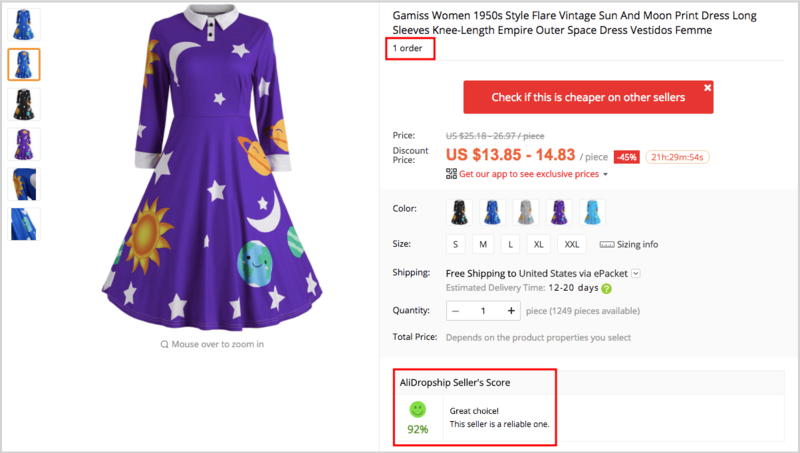 From today’s research, you will learn more about choosing best products to dropship from AliExpress, and filtering out the least appealing items. What makes a product totally unsuitable for your dropshipping store? And what, in turn, makes an item an absolutely great find for your business? How to dropship the products that will definitely bring you sufficient profits? Here, we will show how to evaluate AliExpress products to check if they are worthy of your time and attention. Obviously, the main idea of your ecommerce store is to sell the items that will be purchased often. This means that the best dropshipping items are the products that are desired and requested by your target audience. This is certainly the most important parameter for any drop shipper. Obviously, there’s no reason to fill your eCommerce store with the items that no one needs. 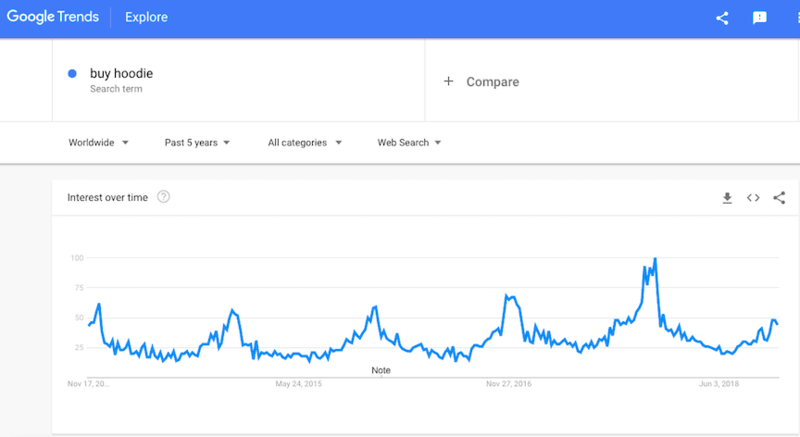 Ideally, when starting a business, you should go on Google Trends. There, you will check if people are commonly interested in this particular product. Here, we were analyzing the demand for 3 product types: sweaters, sweatshirts, and hoodies. All of these are warm clothes protecting the wearer from cold weather and providing additional comfort. It means that they solve the same issue for a potential buyer. But, as you can see, the demand levels are totally different. Still, there is a similarity. 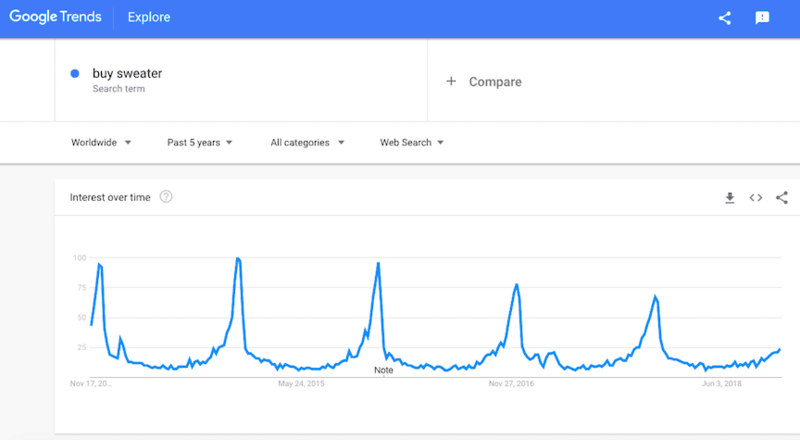 For these graphs, we took the period of 5 calendar years. Do you see that all the 3 graphs have the same pattern of peaks and falls? These fluctuations happen during a specific time of year. 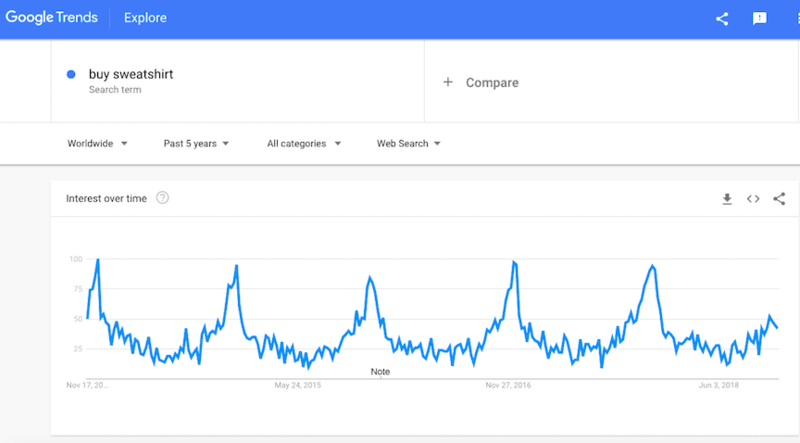 Every year, there are the same periods of time when the demand goes super high, and there are periods when the demand is close to zero. It means that these products have a seasonal nature. It is not a bad thing itself for product sourcing. Nevertheless, you should always remember that if your dropshipping store contains seasonal products only, the volume of your sales and profits will be unstable during the year. And if you compare the 3 graphs again, you’ll notice that the peaks and falls of the hoodie graph aren’t as sharp as the ones on the sweater graph. It gives you a reason to assume that in this example, hoodies are a more reliable product type. Still, ideally, you should mix them with non-seasonal items in a store offer. Choosing generic, plain, boring items for selling online is a serious dropshipping mistake that has a huge influence on sales. 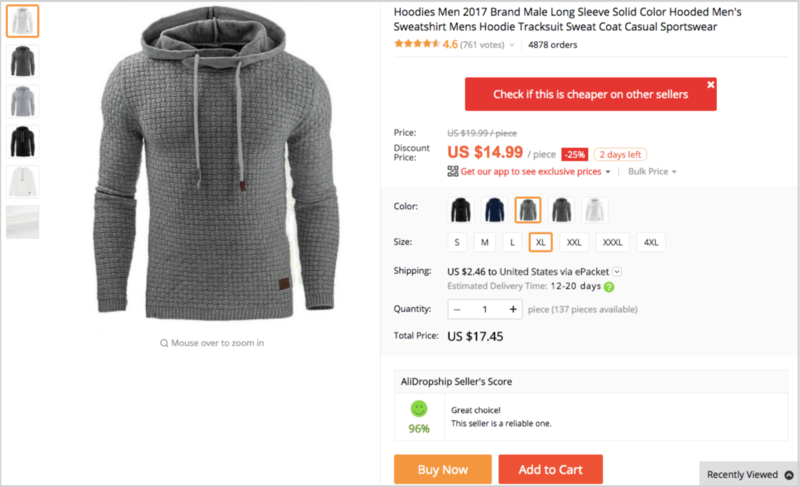 This is an AliExpress hoodie that costs $13.99 and has a rating of 4,6*, 25 reviews and 34 orders. As you can see, the item has a moderate price, a large clear picture of high quality that shows the product in actual use, and a good description with the relevant size chart and lots of illustrative pictures. Plus, both the store rating and the item rating are quite fine. Still, judging by the low number of reviews and orders, none of these are convincing for potential buyers. 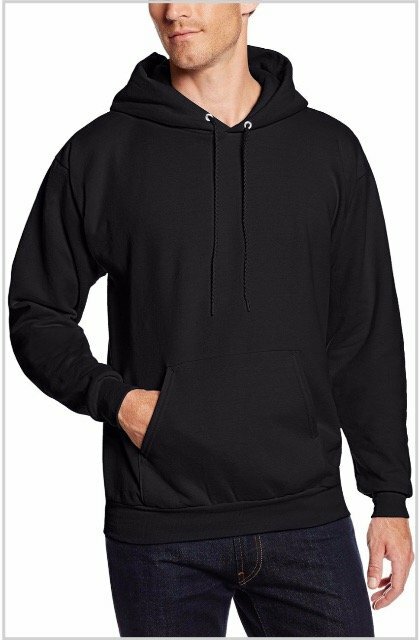 This is an AliExpress hoodie that costs $16.79 and has a rating of 4,6*, 3491 reviews and 6333 orders. This is an impressive difference, right? Even though this item is slightly more expensive and the product pictures are obviously photoshopped, this hoodie is 185 times more popular! 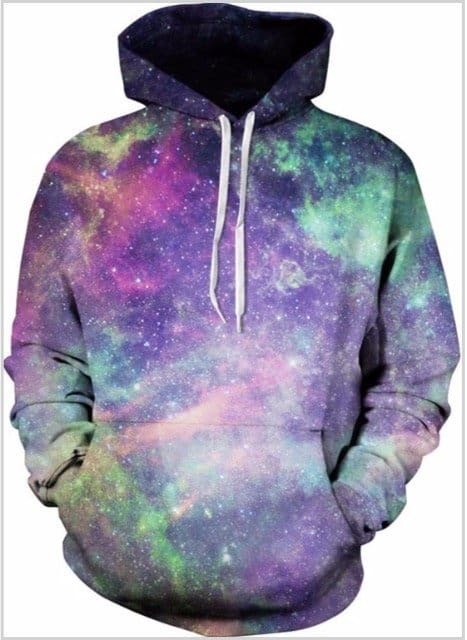 It’s obvious that the reason for such a huge demand is the unusual hoodie design: the space print heavily attracts buyers. Indeed, it’s easy to find a basic monochrome hoodie with an ordinary cut nearly in any offline store – you can buy it on the spot and waste no time waiting for its delivery. The space printed hoodie, in turn, is quite a rare find for the majority of other stores, and it certainly attracts more interest of a store visitor. And this is how we go over to the next product feature that is an absolute must-have for each and every of your dropship items. Basically, impulse purchases are a major driver of growth for any dropship store. For such stores, neither fast shipping nor low price is a competitive advantage that can lure a visitor into making a purchase. In this case, the only way to persuade a visitor to order something is to create an appropriate atmosphere for buying impulsively. This can be achieved through a number of ways (making a catchy store design, creating a sense of urgency, showing intense buying activity, providing other buyers’ experience, etc. ), but if your products are not appealing enough, none of these tools will help you. Let’s look at the example of sweatshirts. To make a more fair comparison, we will take 2 different product offers from the same seller. 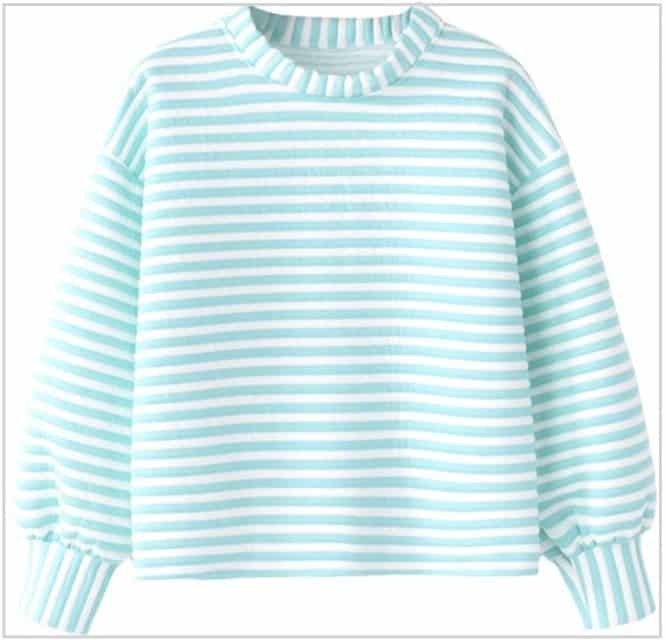 The first item is a striped sweatshirt in pastel colors that costs $13.49 and has 5 orders, 0 rating and 0 feedback. 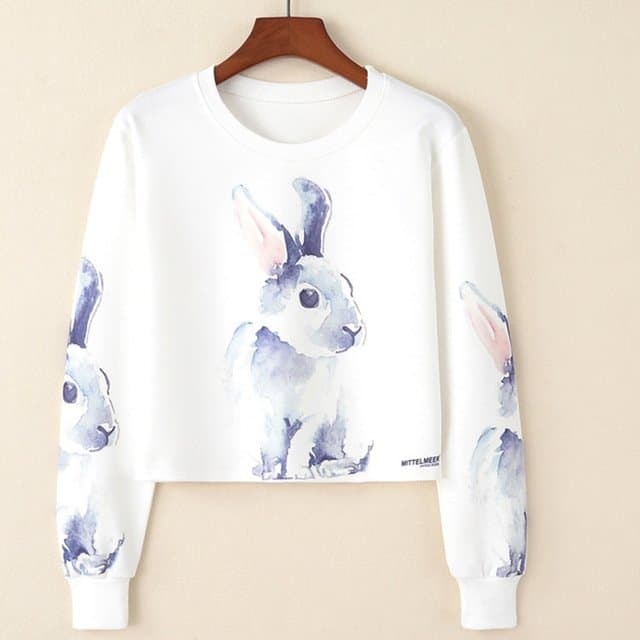 The second item is an aquarelle rabbit printed sweatshirt that costs $9.83 and has 1983 orders, 4.7* rating and 1004 reviews. The numbers speak for themselves: people are more likely to buy emotionally charged products. This is the reason why cute, adorable, kawaii products are quite often chosen by dropshipping store owners. But, you don’t have to limit yourself with ‘sweet’ stuff! Anything that immediately creates a strong emotional response is a good choice. Try to find products that manage to do it. 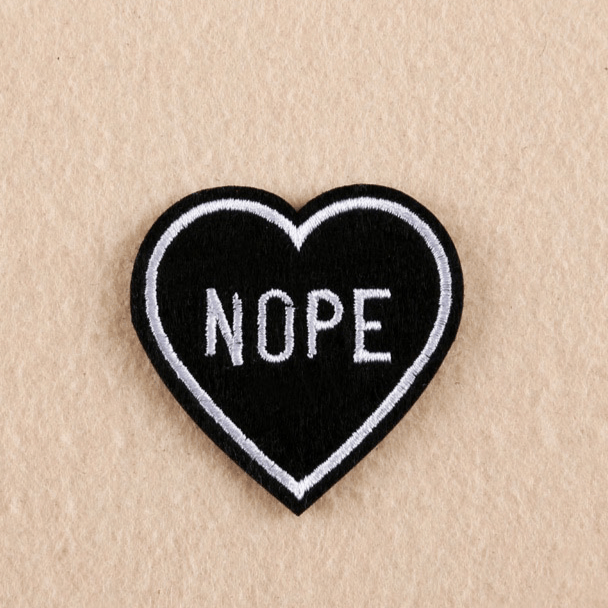 This sad patch is not exactly cute, but, thanks to its semi-sarcastic emotional drive, it got 1594 orders, 1103 reviews, and an impressive 4,9* rating. Not bad, right? It can cause various feelings, of course, but you can benefit from these emotions anyway. 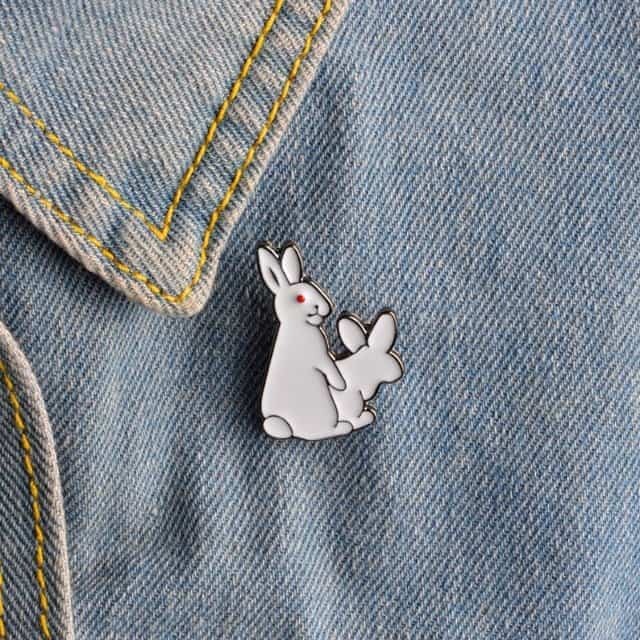 Judging by the 1512 orders, 462 reviews, and 4.8* rating, the pin is really popular. Emotions matter, as you can see! There is a simple rule: the lower is the original seller’s price, the higher is your potential profit. 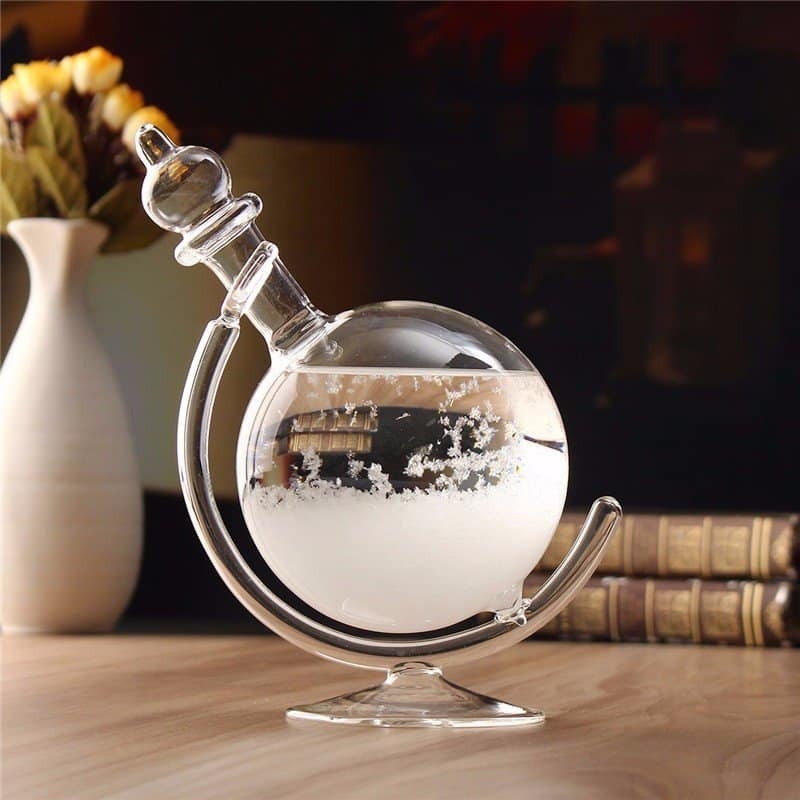 The item itself is good: it comes from a reputable seller and has a 4,5* rating, 189 reviews, 507 orders, and the free shipping option (plus, the supplier can ship it from the United States in a super short period of 4-13 days). The only downside is the price: if the seller asks $34.99 for this hoodie, imagine how much the item will cost after you apply the markup formula! 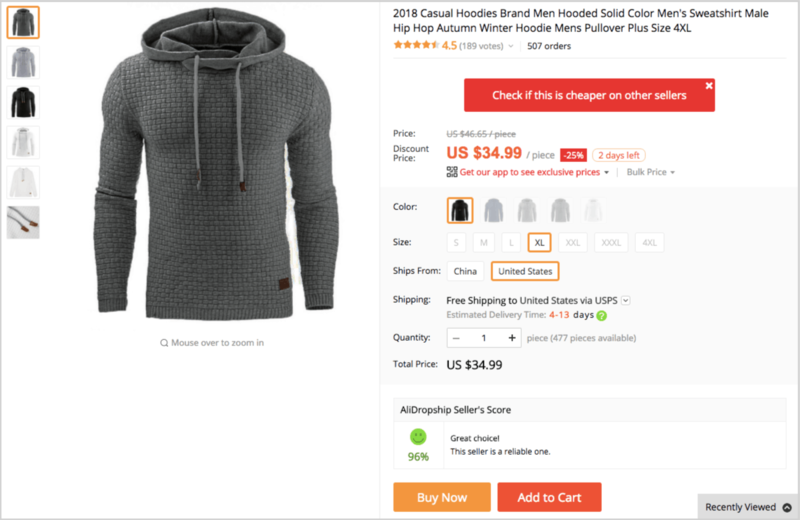 This hoodie is also a great find: it has a 4.6* rating, 4878 orders, 761 reviews, and the ePacket shipping option that allows a 12-20 days delivery time. Together with the shipping fee, the total cost of this hoodie is only $17.45. So, it’s not that hard to guess which of the two items is more beneficial for your store, right? If you want to lure your store visitors into making an impulse purchase, don’t charge any extra fees for shipping. Quite often, people leave online stores without completing their orders simply because they get unhappy with the total order cost. Surely, a high shipping fee is a common reason for it. Alternatively, you can only select the items that have the ePacket shipping option. AliDropship Google Chrome Extension easily shows you which products have this feature and which ones don’t. We traditionally recommend to stick to the items with ePacket delivery option for a very simple simple reason. This shipping method allows your buyers to receive their packages really quickly. 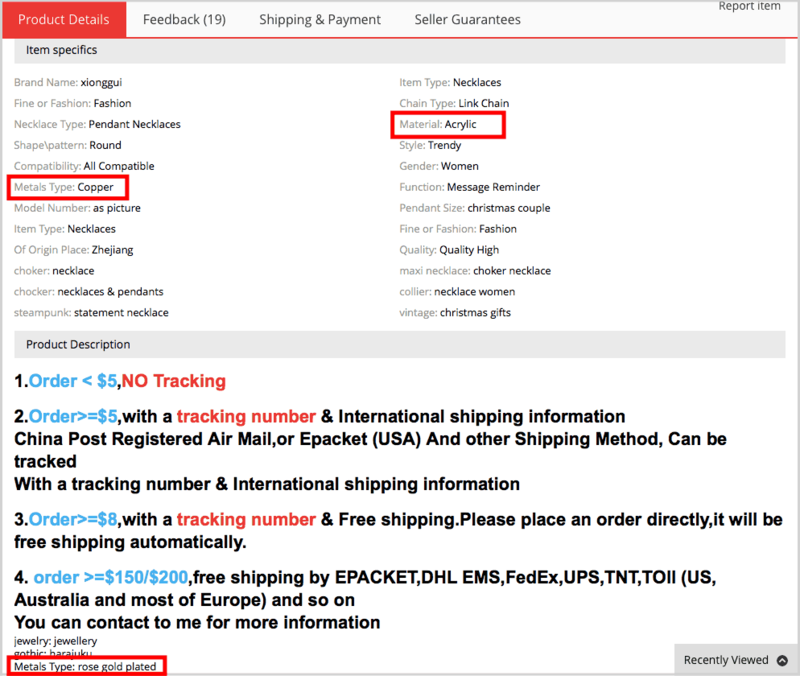 With ePacket, the long period of AliExpress shipping is not a problem anymore. In this case, the seller will promptly deliver the products directly to your customers just in a couple of weeks. What’s also great, the shipping fee in this case is usually quite low, so you can simply include it in the item’s final price. The product will still remain affordable, and your customer will be happy to see the ‘Free Shipping’ phrase. A good dropshipping product is an item that helps you differentiate. We have already discussed this subject above when we were talking about the benefits of unique products. It is really important for you to build a memorable store identity: a specific pleasant atmosphere in your webstore makes it more appealing for buyers and helps you compete with AliExpress and other online selling platforms. At the first glance, it might seem that these two items can be easily included in the same store offer. Both of them are unisex sweatshirts with soldier-related prints, so they seem to be suitable for a store dedicated to military stuff. Still, they are not exactly similar: they certainly generate differing emotional response, and each sweatshirt has its own ‘tone’. While both of them are a good find in terms of popularity and feedback, your final choice should depend on the desired atmosphere you’re trying to create in your store. According to AliExpress official policy, it is not legal to sell branded products through the platform. Still, this restriction only applies to globally known brands because it’s aimed on fraud prevention. At the same time, lots of items on AliExpress are in some way ‘marked’ by local manufacturers. Many products have some kind of a logo or brand name on them. As we see on this example, some Asian-based manufacturer put the producer’s name on the item in a very distinctive and obvious way. Are such products suitable for store owners? Normally, they are not. When you’re trying to build your own store identity, the best strategy is to avoid items that show the manufacturer’s name (especially if it’s done in such an eye-catching manner). 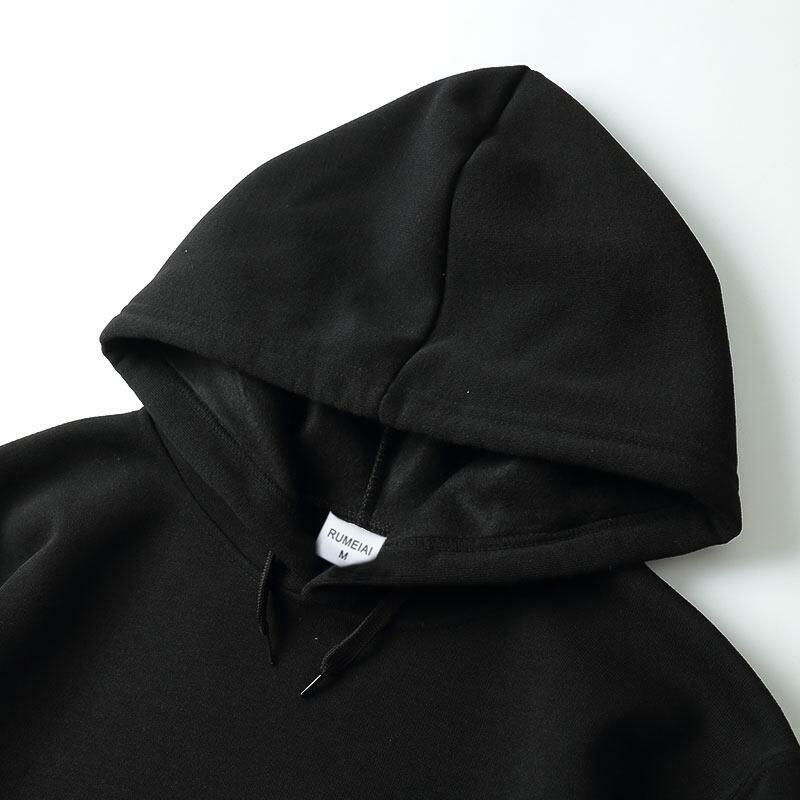 This example shows a hoodie label with the product size (M) and the manufacturer’s name (Rumeiai). The brand name is rather discreet and you don’t see it on any other part of the hoodie. So, it is perfectly acceptable to add this item to your store. Let’s assume you’ve noticed a super cool item on AliExpress. Imagine that this product immediately got your attention because of its unique nature, affordable price, and strong competitiveness. 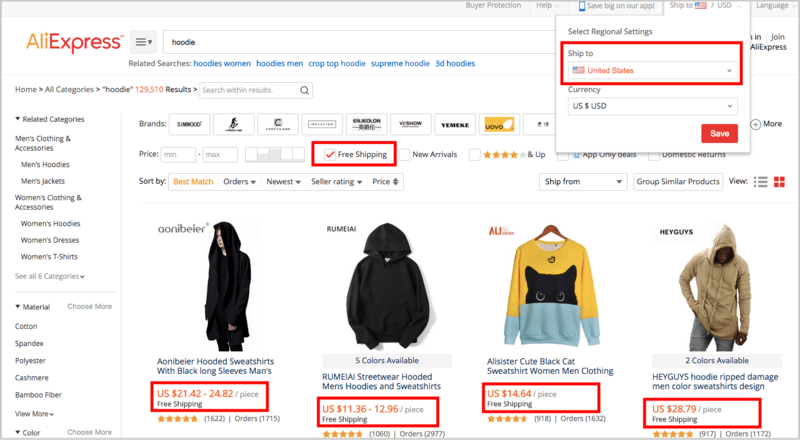 Does it mean you should immediately import it into your dropshipping store? 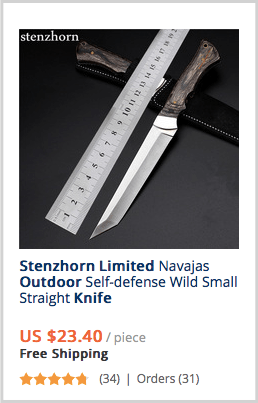 Before you do this, you need to go to this product page and examine it super carefully. The reason for this is simple: further, you will have to edit single product pages in your own store, It is a necessary action if you want to improve your conversion rates! Well, if this item has already caught your attention, most likely, its main image is good (otherwise, you’d never had noticed it). But a single photo is not enough! The price is great, the shipping cost is tiny, the feedback is positive, the preview image looks fine – it’s a perfect product, right? But, once you open the product page, you notice that the picture quality is not that high. Plus, it is the only image in the picture gallery, and the description box only provides 2 additional product-related pictures that don’t give much information as well. This is not the type of item you should be looking for. For your store visitor, product images are basically the only source of knowledge about this or that unknown item. Check both the product gallery and the item description to find out if there are enough informative pictures. Ideally, the pictures should demonstrate an item in actual use, plus, there should be close-up photos showing the product details. The product has multiple variations, and each of them is clearly visible. The seller provides a large picture of a high quality to prevent confusion and misunderstandings. The photos are professional and appealing, and you can view the product from various angles. 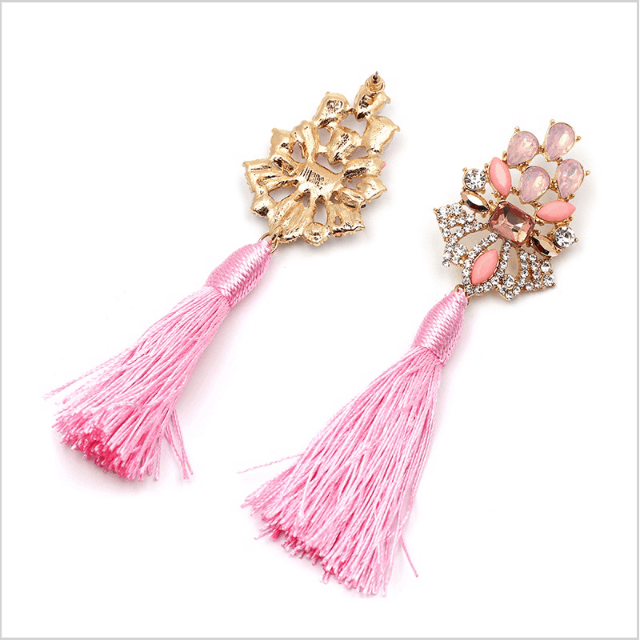 You can even see the back side of the earrings and the fastenings type! 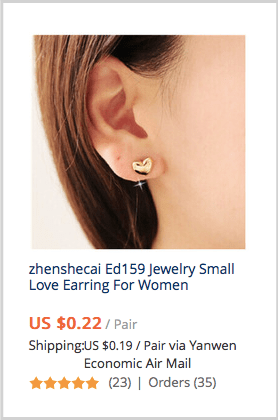 If you scroll down to the description box, you will also see the pictures that give indications of the earrings’ size. There is a measurements picture, and there are photos of the earrings placed on a mannequin for scale. Even though the measurements picture contains some unnecessary info like the company name, you can easily fix it with the help of Image Editor. An online store visitor can’t physically see or feel the item, which is why many questions may arise considering the item’s features. You need to be able to answer any of them correctly and professionally in order to provide a high-quality customer service. Also, you will need to fill in the item’s description to make your store look credible and trustworthy. For a necklace or any other simple type of product, such lack of information might be just disappointing, and not really disastrous. But what if something similar happens to an item of a more complex nature? How can your customers make sure that it’s a quality product satisfying their needs? Having no data to rely on, a potential customer will simply leave the store without making a purchase. AliExpress reviews serve two really important purposes. First, they prove that the item was actually bought by someone else before. For online shoppers, it is quite relaxing to know that another person has successfully purchased this exact item from this particular seller. 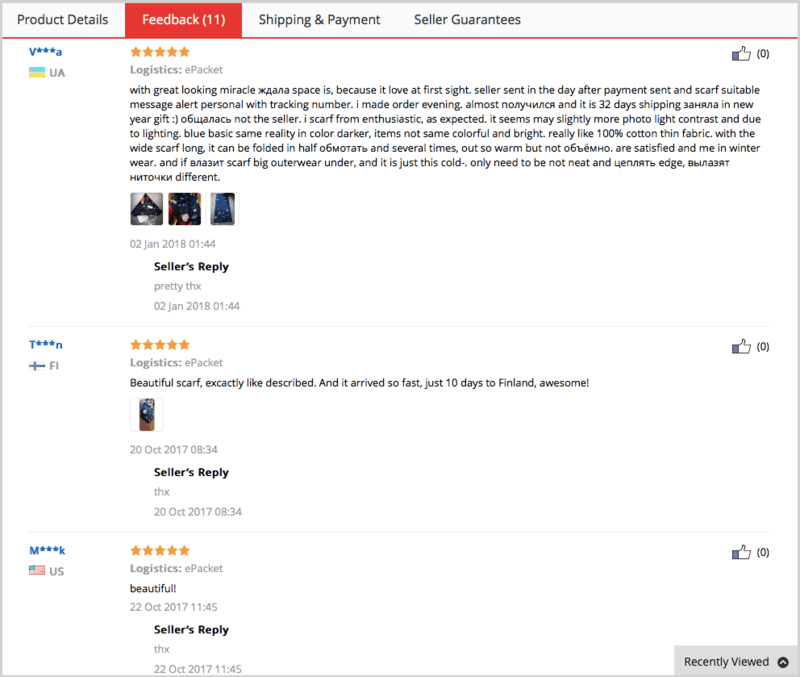 Thanks to AliDropship plugin’s feature of reviews import, you can make sure that the products in your store have the same reviews they had on the AliExpress seller’s page. 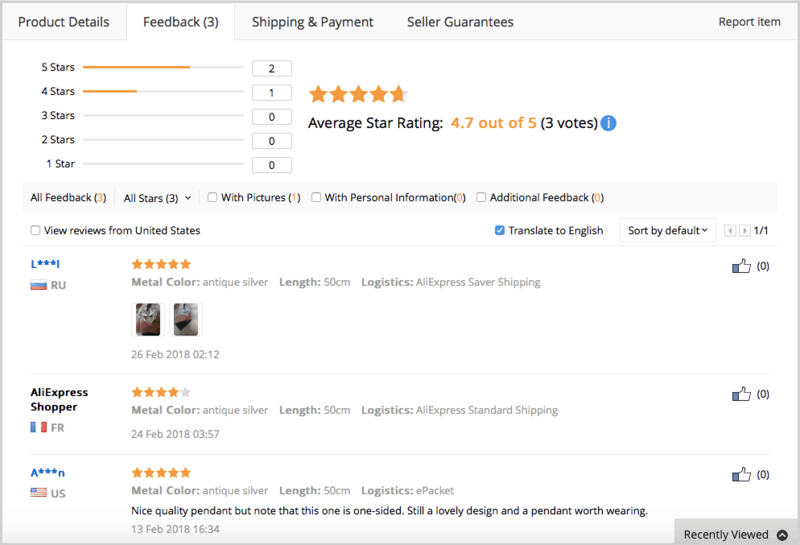 Such reviews get even more helpful after you install Customer Gallery add-on: this way, you let your store visitors view the real-life product pictures made by previous buyers, plus, you provide the direct links to the items featured on these photos. It’s vital to note, however, that the quality and content of reviews matter: please look at the example below. The reviews are positive and seem to be authentic, but, due to the automatic translation to English, the first one looks really messy. You can vaguely understand that the buyer is happy with the purchase, but this review doesn’t add much to your store credibility. You should either leave such reviews untranslated if they are written in your target audience’s language, or simply delete them. The second important purpose of product reviews is to help you decide whether you’d like to import this product directly to your store. For example, take a look at this product: it is an unconventional yet affordable item with high quality pictures and a detailed description. It seems like a good find for your store, but it doesn’t have many orders yet as it’s been found in the ‘New Arrivals’ category. Should you take a risk and add it to your store? One default review simply proves the fact of completing the purchase, while two others give a bit more details. There, you can see real-life photos and some clarification on the pendant design. So, the buyers actually received their orders, and they seem to be quite satisfied with the product quality. The item is worth trying, most likely! Most drop shippers pay attention only to wholesale prices, but the seller’s reputation is also a crucial factor to consider. It is especially relevant if you’re importing items with minimum orders and zero feedback. This strategy is quite common: business owners focus on new market arrivals with a strong potential. The dress looks awesome, has an affordable price, and has the ePacket shipping option, which is great. But, it’s new on the market: there is only 1 order in its history, and there are no reviews yet. Still, the seller is reputable: it has a good store rating. So, we can assume this supplier works professionally and doesn’t sell items of poor quality. Finally, it’s time to talk about serious things: limitations and restrictions. Commonly, these 2 issues are connected to each other; they arise because of the same reasons, and it’s wise to never let any of them happen. Do you remember that we’ve mentioned something about AliExpress own ban on branded items…? Technically, the platform forbids selling such items, but here it is, shining bright. We don’t recommend adding something of this kind to your store. 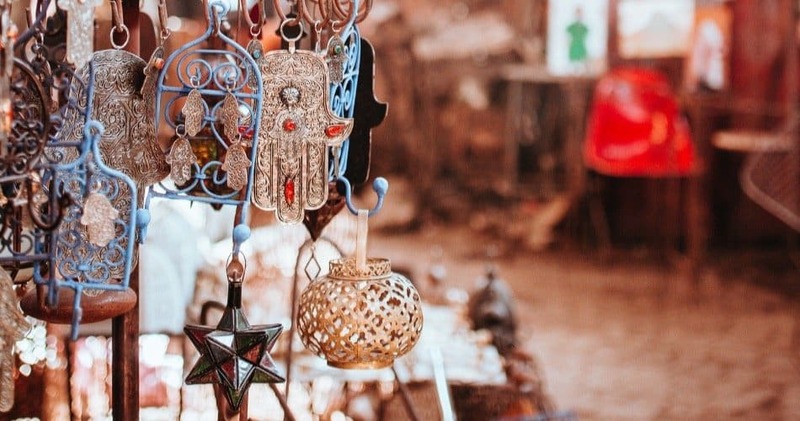 If it’s a replica of unsatisfactory quality, the buyers will most likely get disappointed because of unmet expectations, and their negative feedback won’t do you any good. Plus, most likely, you will have difficulties while promoting these items on social media (Facebook ads, Instagram shoutouts, etc.). If they get wide coverage, they will certainly get attention of the original brand owners, authorities, or just concerned individuals. Your social media account might get blocked, and your whole business will get compromised. That’s not what you want, right? And you cannot avoid using this kind of promotion, as other sources – email marketing or something else – cannot provide such great coverage of your target audience. The item below is a good illustration of a product with a provocative nature. A customs officer would be likely to ban it from entering the country. Every country has its own understanding of the legal items for import. These regulations even apply to online orders of private individuals. There might be some restrictions on importing defense articles, hunting tools, military-related items, smoking devices, etc. If you are not sure that it is safe and legal to ship this or that product to your buyers’ country of residence, please check it twice, and if you’re still doubting, just leave it out. 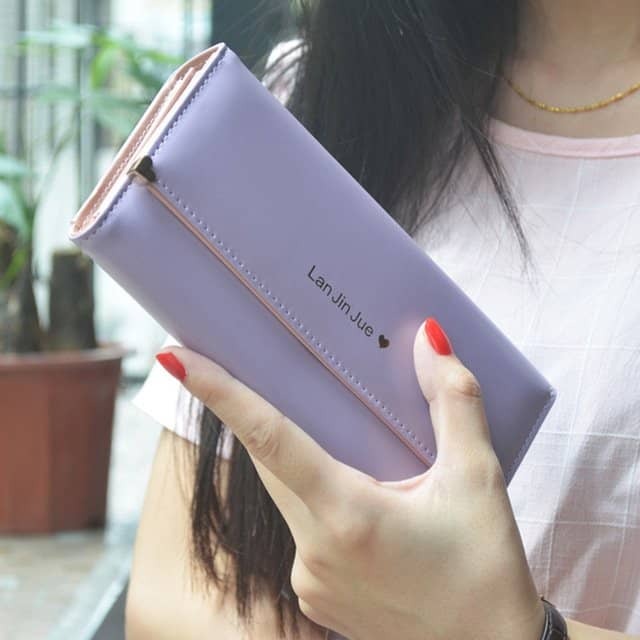 The item on the picture below is super cute, but somewhat tricky. Product delivery takes a lot of time; during the shipment process, the package will certainly see some external impact. No one likes receiving deformed or broken items! This is why the products of glass, ceramics, or other similar materials are sometimes a questionable choice. If you still want to have them in your store, talk to the relevant AliExpress seller first. Ask about the used type of the packaging materials, and read the previous buyers’ reviews. This is how you will find out whether the seller can actually provide the items with a secure and damage-proof package. 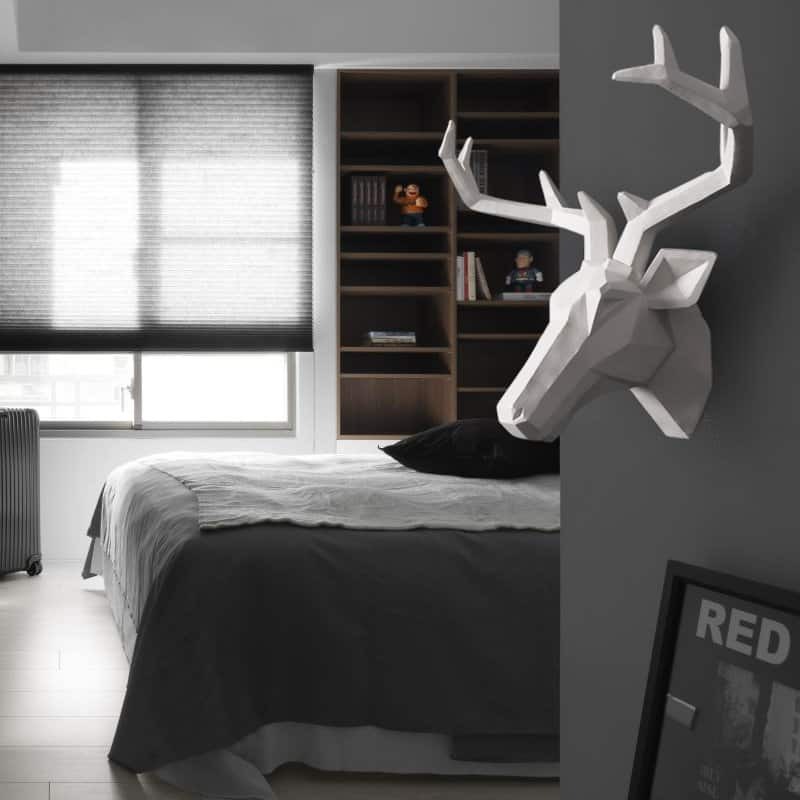 According to the seller’s description, the weight of the package containing this animal-head piece of home decor is 4 kg. Even for domestic shipping, such items are usually a bit tricky. International delivery, most likely, will demand some extra shipping fees, which is not a good news for your buyers. Plus, the heavier items are inconvenient to manage. Any unpleasant incident that happens during the loading activities may result in the product damage. 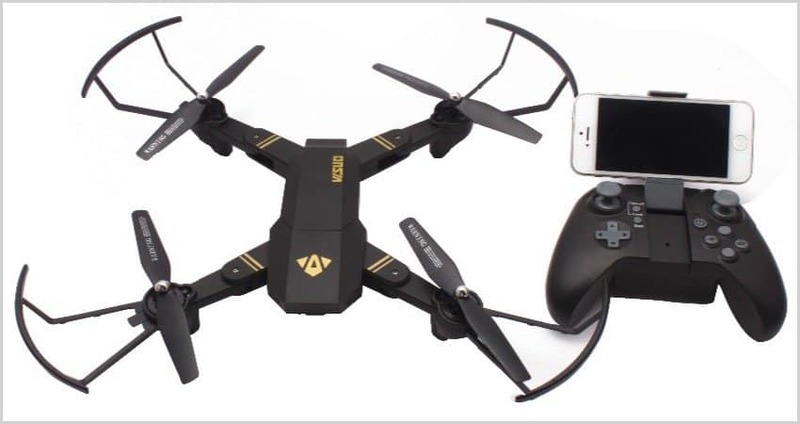 The picture below shows an example of a drone offered on AliExpress. Even though the gadget industry shows a rapid favorable growth, it might be a better strategy to focus on the relevant accessories and spare parts instead. The reason for this precaution is simple: neither you nor your buyer can physically examine this complicated piece of technology. So, none of you can be 100% sure in its perfect working order. If something goes wrong, you will have to deal with the standard return and refund routine. Generally, it is a simple and quick procedure, but if you’re dealing with costly items (and gadgets are quite expensive, as you can guess), the whole process might get a bit longer and trickier. This dress is exquisite and looks fancy, but, as you guess, it requires a specific body type, plus it needs to be tried on before purchase. You have certainly seen some funny ‘AliExpress: Expectations vs Reality’ posts on social media, and this is exactly what might happen to your buyer. When a store visitor has no way to try on a piece of clothing before purchase, there are two possible scenarios for this customer. The client will either leave the store without completing the order, or buy an unsuitable and disappointing piece of clothing, and return it later. None of the options is really great, right? 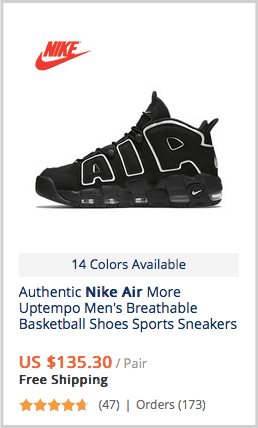 The same is true for shoes; here’s an illustrative picture from a seller’s page. Even the modelling person clearly has some inconveniences with wearing these high heels; can you expect that a random customer’s feet will definitely fit into this pair of shoes? This is why we recommend picking oversize clothes and items with a loose cut. Since they don’t have to fit you tightly, buyers with any body type can pick and wear them with no stress and discomfort. That’s all for our drop shipping items recommendations! We have collected over 50,000 best dropshipping products in a single database! 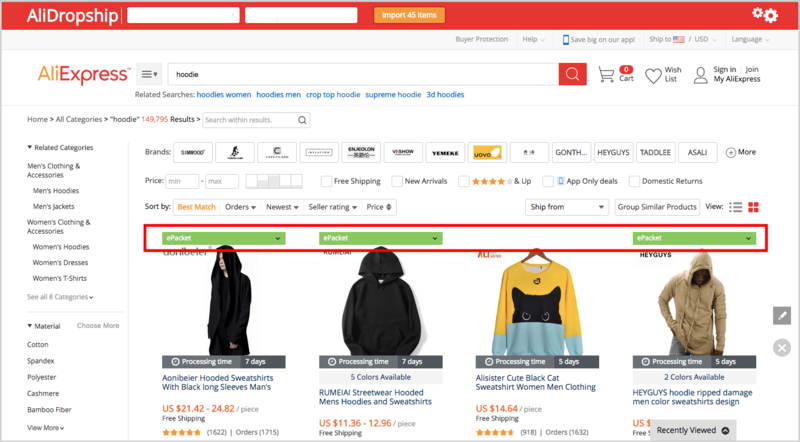 Our new, extraordinary DropshipMe plugin contains a list of more than 50,000 promising AliExpress items to dropship (their number is growing daily). It means that from now on, you can pick any of the items from this list, and import them directly to your store. In seconds, you will get popular, money-making items with catchy and appealing single product pages. Imagine how many long hours it will save you! And oh, do you know the best part? A free package is available! You can import up to 50 items at zero cost! To learn more about this plugin and its features, kindly read this article. Follow our instructions and fill your dropshipping store only with the best products to dropship: they are guaranteed to bring you great returns! Great advice. As a startup it puts me on the right track. Baby Strollers are also heavy, do you think they should be part of any store’s product listing. All products are presented on AliExpress.com, you can select any item, they all are available for dropshipping and can be easily added to your webstore powered with AliDropship plugin.